Real Estate Scorecard provides in-depth research and candid insight into the overall happiness and satisfaction of over 400 master planned communities in the Southeast. 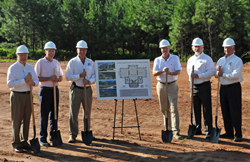 The Reserve at Lake Keowee, an award winning Lake Keowee real estate development, has broken ground on its new Fitness Center and is set to open in the first quarter of 2018. The new 5,000 square foot facility is designed by Stephen Fuller Designs and being built by Pyramid Construction, Inc. and will be located less than half a mile from The Orchard House clubhouse and the Village Center – the community’s primary gathering place. View the renderings and a floor plan here. The facility will feature three large areas: one, intended for group classes like yoga, Pilates and spin classes; the second, for aerobic/cardiovascular equipment; and the third, dedicated to strength training and free weights. The center will also include two massage/physical therapy rooms and shower and locker rooms for men and women. Additionally, future expansion opportunities have been factored into the design. The fitness center will be accessible to The Reserve at Lake Keowee’s members and their guests 24 hours a day, seven days a week. Created in 2000 by Greenwood Communities and Resorts, The Reserve at Lake Keowee is an award-winning Lake Keowee real estate development that spans 3,900 acres in the foothills of the Blue Ridge Mountains, with 30 miles of shoreline on Lake Keowee and convenient access to nationally recognized commercial and cultural centers that include Greenville, S.C.; Asheville, N.C.; and Clemson and Furman Universities. A 200-slip Marina, Village Center, Jack Nicklaus Signature Golf Course, and more than 1,400 acres of parks, preserves, trails, and green spaces highlight more than $100 million in completed family amenities at The Reserve. The Reserve has approximately 700 members from 30 different states. Homesites at The Reserve are available from $100,000 to $950,000; homes from $500,000 to $3+ million. To learn more and schedule a Discovery Package Stay, call 877-922-LAKE (5253). Pyramid Construction, Inc. was formed in 2000 focused on constructing high-end residential community amenities. It constructed The Reserve’s current Tennis & Fitness Center and the Pool Pavilion complex. In the years since, Pyramid has grown to develop both amenities and luxury homes. After developing the Guest House Cottages in The Reserve at Lake Keowee, Pyramid has also begun development within The Reserve building Village Point’s Phase I and II, the Laurel Pond Cottages and the High Grove neighborhood. With 25 years in the business, Stephen Fuller Designs specializes in combining modern lifestyles with traditional nuances. Stephen Fuller Designs has concepted houses, communities and gathering places, focusing on classic architectural design.